"Any mountain, big or small, is no match for Marmot's Big Mountain Gloves. 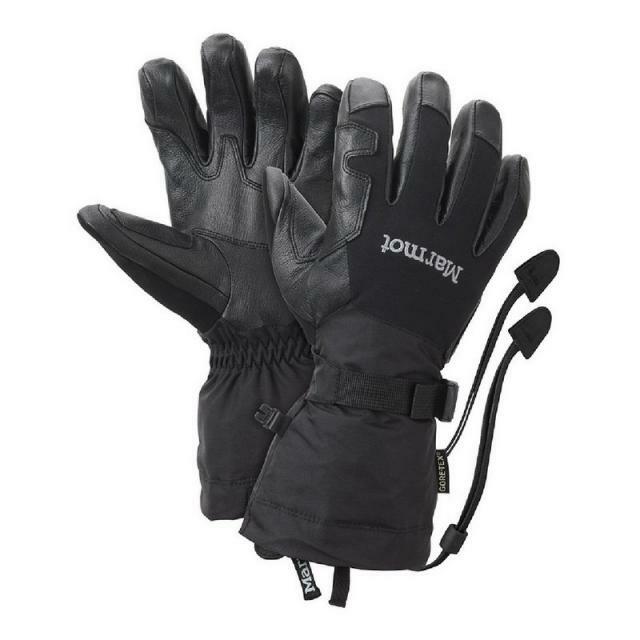 Insulated with Primaloft and given a GORE-TEX liner, this glove offers some of the best heat insulation and waterproofing there is. Combine warmth and weatherproofing with a convenient and comfy drawstring, and the Big Mountain Gloves are sure to have you toasty and impressed. PRODUCT FEATURES: Main Materials: MemBrain 2L 100% Nylon 4.4 oz/yd, Washable Leather 06.-0.8mm Lining Material: DriClime 3-Dimentional Wicking Lining Insulation Material: Primaloft One- Patented Synthetic Down, Low Bulk, Warm, Water Repellent Reinforcement Material: Washable Leather 06.-0.8mm Glove Insert Material: GORE-TEX Glove Insert--Durably Waterproof, Windproof and Breathable Weight: (Large) 0lbs 8.26oz (234g)"